Green Side Up is a family owned and operated business servicing all of Southern New Jersey. Owners are Russell and Sherin Nardi, who believe that quality, service and knowledge are key components that will provide an excellent experience with Green Side Up. We provide all that the big nameless companies offer but with a personalized family friendly touch. When you become a customer, we know you and you know us. Green Side Up is based right here in South Jersey. We’re your neighbors, and we are only a phone call away. We understand the soils, grass types and weather conditions in our area, and our services are specifically designed to meet the unique needs of your lawn through each season of the year. 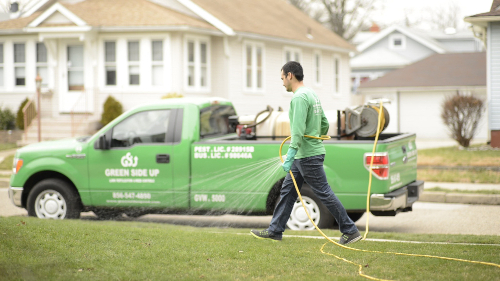 We’re licensed, insured and fully trained to give you the healthy beautiful lawn you and your family deserve. We know the value of good customers, good partners in growth and good friends. Every service is confirmed with the customer before the service is performed. Our customers never come home to find a flag in the yard and an invoice on the door without knowing ahead of time a service was scheduled. This gives the customer an opportunity to ask questions and understand the process better. Unfortunately this good service technique is very rare in the lawn care industry. It helps retain our customers and it’s the courteous thing to do. Green Side Up provides FREE service calls. Many issues in lawns need monitoring and as the lawn professionals we are glad to visit when needed. These service calls are done at the customer’s request and are scheduled at their convenience. “Family owned and operated” is a huge benefit in the lawn care industry. Nobody wants to be treated like a number, which is how people feel many times with the large mega-corporations. Green Side Up values every customer and truly cares about customer satisfaction.